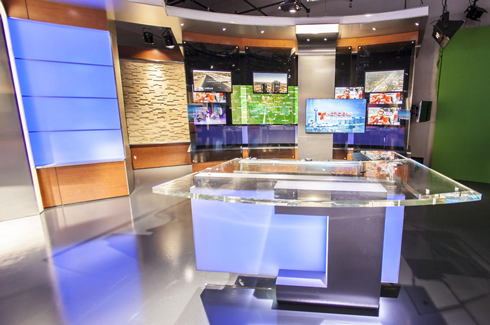 KXAS-TV, the NBC O&O in Dallas-Ft. Worth and its sister station, Telemundo station KXTX-TV, have released a sneak peak of their new studio sets, which debut Sunday. Earlier this month, the two stations began relocating to a new facility in CentrePort Business Park, built on the site of the former Greater Southwest International Airport. When the building opened, the station was mum on the building’s sets, which were designed by Jack Morton/PDG and fabricated by blackwalnut, saying they were still in the process of being installed. 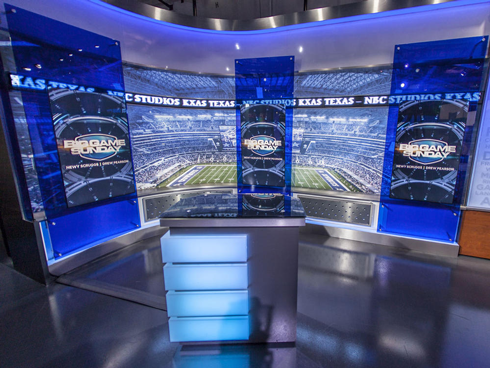 KXAS-TV will originate its newscasts from in front of a massive 5×3 curved, freestanding video wall — a unique application for the near-bezeless monitors that are popping up on sets all over the country. The anchor desk, fronted with an internally light element, station logo and horizontal wood slats with backlit reveal lines, appears to accomodate two seated positions with wings that jut out on either side for standing talent, presumably for weather, sports or in-studio reporter debriefs. The video wall is flanked by two uplit columns that feature blocks arranged in an interesting geometric pattern. Running behind and to the sides of the screen array, meanwhile, is a straight wall with backlit panels fronted with plexi panels with community names emblazoned on them. The weather center, meanwhile, offers a standing presentation pod in front of a 4×4 video wall that’s surrounded by a backlit wall. Next to this area, a semi-enclosed work area mimics the look of a control room. Nearby is a chroma key wall, as seen in the photo above, so it will be interesting to see if the video wall is used for full forecasters or just portions of them. The set also features a separate area designed for sports, which includes a curved printed background and vertical blue panels that frame vertically mounted flat screen panels. A square shaped pod with four internally lit slats is also included. The studio’s interview set uses soft, pale yellow walls as well as columns that match the ones found at home base. Along the back wall, four vertical flat screens create the illusion of a picture window. Beneath this, a knee wall matches the columns, while either side of the interview set includes open bookshelves. 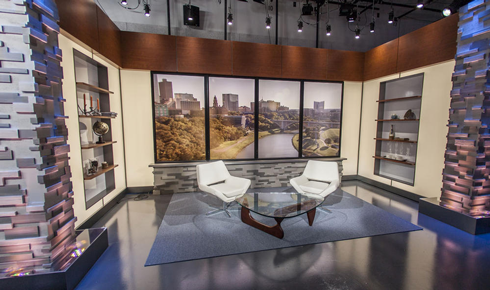 Props, too, for KXAS-TV, for picking out furniture for this area that actually looks good (and matches) the set! So many sets end up using furniture that looks better suited for a doctor’s waiting room than on a trendy news set. Overall, this set represents as huge improvement for KXAS-TV, which has suffered under a series of less-than-spectacular set tweaks and refreshes over the past few years at its old location. The new set also makes extensive use of lighting effects, ranging from the brightness of backlit walls to the dramatically uplit columns that emphasize their bold textures to the grid mounted accent light that add soft splashes to the headers — something that’s particularly noticeable in the interview set’s wood topped walls. 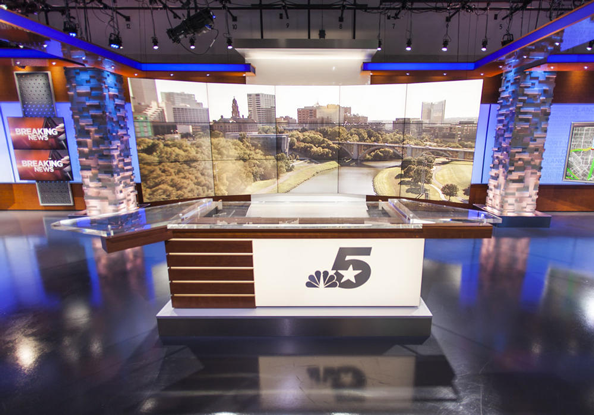 It’s worth noting that the KXAS-TV set wasn’t designed by Clickspring, who has designed the sets at many other NBC O&Os, though the looks have many parallels, including the backlit walls, use of large video walls and use of warm wood tones. 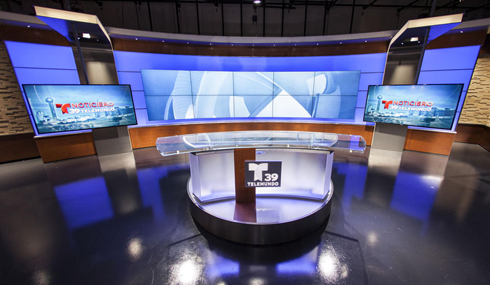 Telemundo 39, meanwhile, has a smaller set that matches well with KXAS-TV’s while not being overly duplicative. Its smaller anchor desk features a icy translucent base with sleek curved glass top. Behind it is a 5×2 video wall that echoes the curved one found on NBC 5’s. Instead of appearing to be freestanding, however, these panels are wall mounted. The rest of this area is backed with backlit walls while two columns reach out over the studio floor as they reach the top of the set, with flat screens mounted on them, presumably to serve as OTS elements for the anchor desk or standups. The far left and right sides of this set feature textured walls that mirror the columns found across the hall. 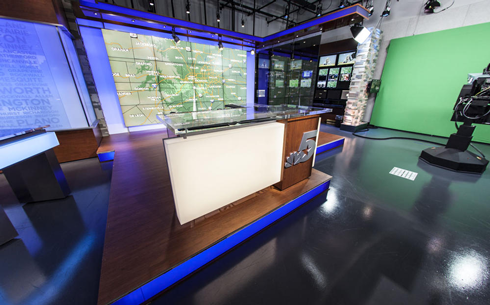 KXTX-TV’s weather center is also smaller, but also includes a presentation pod backed with a monitor array and layered glass panels, including one mounted on an L-shaped column and header element similar to the one on the main set — which in turn are similar to the wider one found in the center of KXAS-TV’s home base that wraps behind the video well. 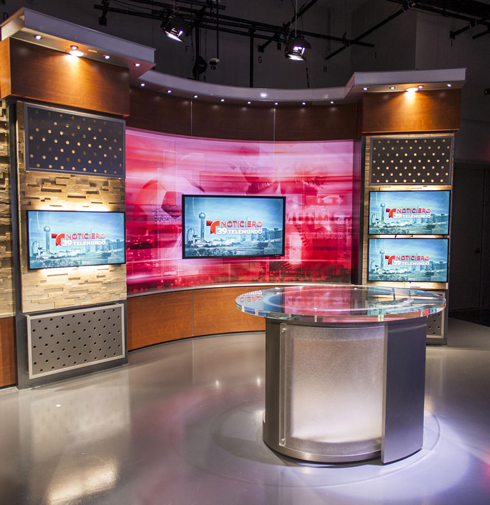 The Telemundo station’s set also includes a multipurpose area with oval shaped pod, and a curved printed graphic. On either side of this, textured walls are accented with patterned panels and additional flat screens. The KXTX-TV set also makes use of some interesting lighting techniques, though it does seem to be a bit watered down from the KXAS-TV studio. Here we can see backlit walls and small accent lights in headers to add downward accent light splashes. The multipurpose set’s accent lighting above and below the flat panel screens and behind the panels is also noteworthy, particularly how the light shines through the dots. Although it’s certainly well designed, it’s evident that the KTXT-TV set got the short end of the stick, so to speak, at least to a certain extent. Some areas of the set seem a bit less refined and on a smaller scale.